SinceEighty6 is always looking to help clients make your fresh idea fresher and are proud to offer Akuafoil inks on select print products. 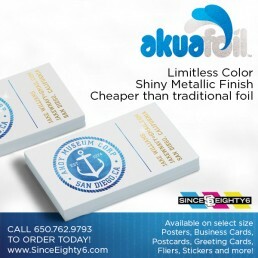 Available now on 16pt Business Cards, Greeting Cards, Trading Cards, Stickers, Flyers, Brochures, and Posters Akuafoil inks give you a wide range of CMYK colors with a sparkling foil finish and an ideal reflection that is priced to give you unique and eye catching product. You can produce foiled half tones, gradients and have multiple colors in foil on the same design. The design possibilities are unlimited. For information on how to setup and design your Akuafoil job for print please click HERE.